“It’s not just another coffee. It’s just coffee. What that means is we are paying people the right price for the right amount of labor. This goes into improving their livelihoods and economic status,” Joji Felicitas Pantoja said with piercing verve, before sipping a cup of fresh brew made by one of the coffee farmers she’s trained and now buys coffee from at fair-trade price.Joji brought us to visit the village farmers’ cooperative, in one of the local communities at the foothills of Mount Apo, in Mindanao. Here, we met with and interviewed smallholder coffee farmers to find out more about the change and impact they have experienced through Coffee for Peace. Joji works to achieve recovery and reconciliation in post-conflict areas, and fights to ensure peace and prosperity. A mother of three grown children and the wife of an unconventional reverend, Joji Felicitas Pantoja co-founded Peacebuilders Community with her husband, and went on to start Coffee for Peace – a fair-trade coffee business advocating peace and social justice in conflict-ridden Mindanao. 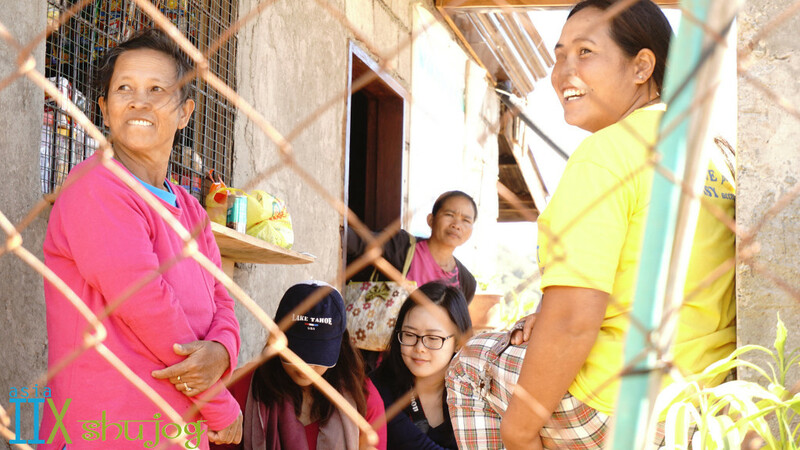 The farmers and their families around Joji beamed, laughing sheepishly and nudging each other. Since 2008, Coffee for Peace has been working with local communities around Mount Apo to promote peacebuilding and sustainable livelihoods through coffee farming. Over 80% of its beneficiaries are women involved in the coffee value chain. 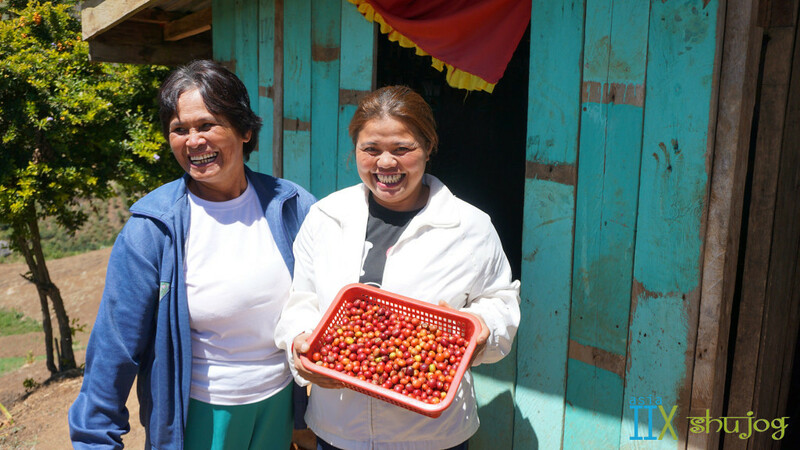 Both mother and daughter are coffee farmers of the village cooperative in Mount Apo. Here, they show us their latest harvest of ripe coffee cherries. Joji wanted to find out what Coffee for Peace’s positive influence has been so far, and how to scale their impact moving forward. In alignment with Coffee for Peace’s business needs, Shujog partnered with Oxfam to provide a complementary impact assessment. Currently, Shujog is partnering with Oxfam to empower marginalized communities, by working with SMEs in the agri-value chain to improve the lives of women, and to scale their impact . We travelled with Joji up to Mount Apo, the tallest mountain in the Philippines overlooking the island of Mindanao, which has been plagued by multiple conflicts for decades. The conflict in Mindanao has been difficult to resolve at the national level, and has been a major reason for impeding economic development in the region, amidst multiple other issues. During the decades of conflict, the densely forested hills of Mount Apo, which are supposed to be protected under national park status, were heavily deforested by large logging and mining companies. Without its natural forest cover, the hills’ topsoil was lost to erosion and rivers built up with silt, while landslides and flooding got worse, claiming more lives. “The only way that we see could resolve the environmental and economic problems, is by empowering the communities to learn how to deal with conflict peacefully. And at the same time, providing a way of livelihood, which is coffee. I have a market for coffee, and a lot of people are looking for coffee!” Joji chuckles as she takes another gulp from her coffee cup. Coffee for Peace envisions ecological recovery through coffee farming. The Arabica coffee thrives in elevated highlands and more importantly, grows best in shaded areas, which incentivizes the farmers to plant native forest trees. 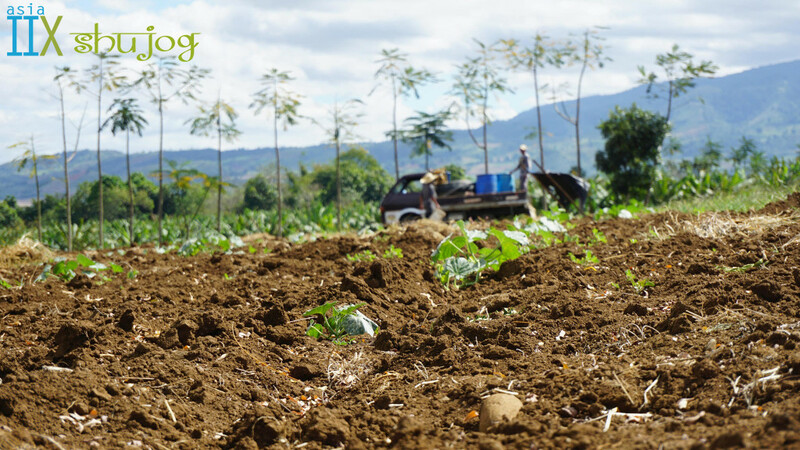 Farmers can continue to grow vegetables and coffee around reforested areas, while the growing trees would help to sustain the very soil and water needed to sustain agriculture, livelihoods and life itself for generations to come. Coffee for Peace advocates for this during their coffee training sessions with the local farmers. “It would protect the environment, it would provide income,” Joji said simply. While at the village, we spoke with Nalgene Libres, the daughter-in-law of a coffee farm owner and a member of the local Bagobo tribe. “Coffee is very important because it is the key source of income to us, next to vegetable farming,” Nalgene told us in a matter-of-fact manner. Nalgene is 27 years old, bright and bubbly and her laughter can be heard two houses down the village road. “With the extra income, we can sustain the daily needs for school-going children. We can have savings to use for emergencies, such as when we are sick. It helps a lot in our family!” she added. 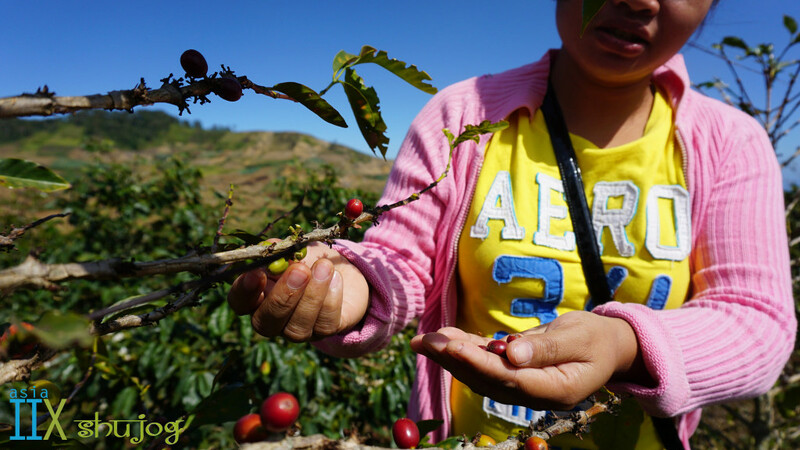 Nalgene Libres picks ripe coffee cherries from a shrub in her family’s coffee farm. She shows us which is ripe and good for picking, and which is not – a skill she picked up from coffee farming training provided by Coffee for Peace. In Philippines, even if farmers successfully begin coffee farming, achieving top coffee grades proves challenging. Currently, only 10% of the coffee produced in the Philippines is considered as specialty grade. What would happen if you didn’t farm and sell coffee? I had to ask. She looked at me for a second, tensing up as she thought about the possibility. Vegetable farming provides the main source of income for most farmers in Mindanao. Often, they are grown in the deforested highlands, and makes for little to no protection for soil erosion. It is also high risk as crop failure often leads to debt for the farmers. “We look at what we do as integrated. So it is very important for us to look at the impact of what we are doing. Are we really protecting the environment? Is this supporting the people who live here in the mountains, and helping to sustain and improve their livelihoods?” Joji shared, citing that these are questions she asks herself all the time. Shujog’s research staff speak with members of the local community that Coffee for Peace works with. Most of them are from the Bagobo tribe, which makes up the largest ethnic group among the indigenous people of Southern Mindanao. The Bagobo are also believed to be the original inhabitants of Mount Apo. Shujog’s impact assessment enables entrepreneurs like Joji to rigorously understand and effectively communicate to stakeholders how they are creating social value. A critical part of the package includes co-designing tools and sharing the know-how to monitor the positive impact of an enterprise. Ultimately, our objective is for enterprises to utilize the measured results to scale their business and the social good they are achieving. It doesn’t end there. We’re committed to supporting social innovators like Joji to scale the impact of her work and empower more lives through it. In the coming months, we will be working alongside the team of Coffee for Peace to provide capacity-building and advice to strengthen the enterprise business and financial plans, and eventually enhance their potential to secure access to funding for growth. 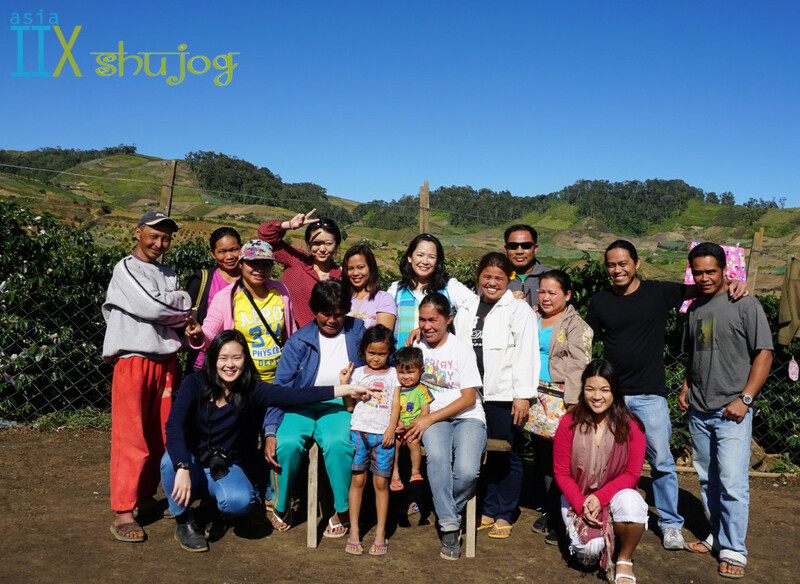 We take a group photo with Joji and the employees and beneficiaries of Coffee for Peace, with the rolling hills of Mount Apo in the background.